Got my make up routine down to 30 mins. From wash face to the lippy. Grats.. I thought I was he only one that timed myself. I always try to do my Makeup and Hair in less then an hour. Multiply your results by say, 100, and you come close to my best time, and I still fudge it up. I look like an steam punk raccoon when I'm done. You did well, now how about coming up to my area and showing me how you do it! You now qualify to work at Indianapolis 500. That is super. Amber L.
I do the daily fire drill in about twenty minutes. 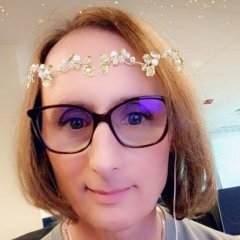 I can't go to work as anything other than female and I still need a lot of help. Everything else about my presentation clues me as female, so make-up is only a small, but required part. Seems almost like I have been doing it all my life. Not so, just a couple of years really and not daily to start. Now weekend events are another deal all together. Lavish bubble bath, skin, hair, nails, about three outfit changes to get the fit. Many accessory changes to get the look all together. Music and dancing too. I love being a girl, so don't mess with my get pretty time. Giggle. Then step out in the world. Everybody knows Jody loves to make a girly-girl entrance! Life is good, babe! I used to time my makeup routine, too. It started at an hour, then as I got my routine down and into a groove I got it down to 30 minutes. Now that I'm done with laser and can eliminate a few extra steps I'm down to 15 minutes. Putting on male-up is very difficult for me but I am getting better at it. Mascara is the most difficult and sometimes painful part for me when the tears start...what a mess! If I don't mess up too bad I can usually finish in about 30 minutes, doing my hair is a whole nother story. What truly shocked me when I started to get really serious about my fem look was how EXPENSIVE make-up can be. SIGH oh well gotta have it! Mascara was one of the products that took me the longest to get comfortable applying because I wasn't used to having anything that close to my eye. Granted I had a few mistakes and poked myself but I got over it and kept on trying. I have very short lashes so I use a few distracting tricks. I start with my favorite eye shadows blended with a very soft artist brush for the smoky eye look. I like copper and gold. Then I use Maybelline Eye Studio Charcoal gel eye liner, that tiny jar has lasted forever! Then a line of Eye Studio Duo, Teal liquid eye liner. While that is wet I use Eye Drama Rockin Rose liquid upper eye liner. It is a pale pink glitter. I use that little brush to pull some of the teal color up also bringing the glitter up into the gold. It make a really nice transition. I place a touch of glitter below my eyes for effect. Then I top it off with my Wet & Wild Color Up pink mascara. All I need is to tip the lashes to make them pop! I get huge compliments on my eyes and they last all day and into the night. It may sound busy or gaudy, but done corectly, the effects are very subtle and elegant. Im getting quite good with my eyes now, but having said that I still poke myself in the eyes from time to time, like last night. Even though I am getting better at the whole thing and can do it quite fast if needed, sometimes I can look in the mirror and think, Hey not bad. Other times I think jeeze Im so ugly and back off it all comes. Wow; 30 minutes, that's impressive!